TORONTO, ON – Amsterdam Brewery has announced details of the latest release in the Adventure Brews series of limited edition beers. When we first brewed a Baltic Porter in 2013 the brewers stashed some away and kept drinking it long after the last bottles had vacated the premises. When we ran out we made some more. In 2014 we won a Bronze Canadian Beer Award in the category and are excited that people enjoy it as much as we do. This time around we used a little more rye, but for the most part stuck to the same recipe. 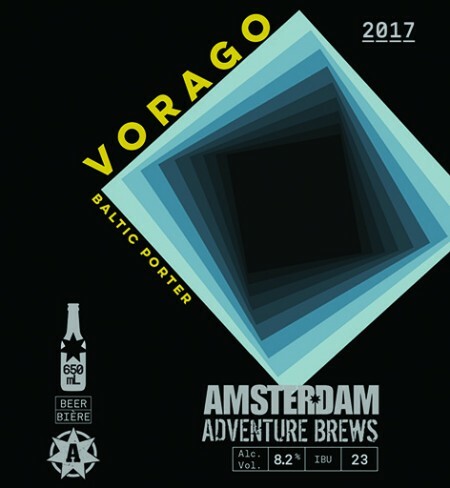 Brewed with roasted and caramel malts Vorago has rich dried dark fruit and chocolate notes smoothed out by a two month lagering. It’s ready to drink today but will age for up to three years. Vorago was released yesterday (February 23rd) in a limited run of 650 ml bottles available exclusively at Amsterdam’s Queens Quay and Esandar retail locations in Toronto while supplies last.